*Our two previous products called Total Haircare and Henna Haircare have now been combined into one single product called "Complete Scalp and Haircare" with better formula and can be used by anybody. Product details: Unlike other hair products, this is not a fancy cream or lotion filled with chemicals. Our Total Haircare Without Henna product is an ancient Ayurveda method of natural hair treatment for dandruff, split ends, hairloss, itchy scalp and several other scalp disorders. It is a 100% natural herbal blend of rare, expensive medicinal plants and essential oils specifically meant for the treatment of hair and scalp problems. There are absolutely no chemicals or preservatives. The product is in the form of a powder and has to be mixed with hibiscus gel to prepare a paste before application. Results and Effects: Stimulates hair-growth, conditions hair, treats dandruff, split ends, itchy scalp, prevents hair-loss, prevents graying of hair, treats many other scalp disorders and a adds natural healthy glow to hair. Amla (Phyllanthus Emblica), Brahmi (Centelia Asiatica), Bawachi (Psoralea Corylifolia), Maka (Eclipta Alba), Neem, and Kachursugandh (Kaempferia Galanga). Plus, Aloe vera or cucumber Gel is added to prepare the herbal paste before it is used. Preparation: Prepare enough paste as and when needed by mixing equal parts of powder, gel and water. Adjust water for consistency. Excessive paste may be refrigerated. Usage: The best time to use is 30-45 minutes before taking shower. Take required amount of paste before each usage and apply the paste all over the scalp starting from the roots. Also apply to the ends of hair to treat and prevent split ends. 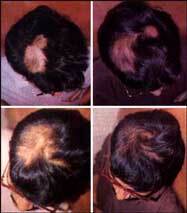 Massage scalp for a minute or two especially if you have dandruff, hair loss or itchy scalp. Let it stay for 30 minutes and rinse it off thoroughly. There is no need to apply shampoo or other conditioners. Please see our Aloe Vera Gel section for details on how you can use aloe vera as a natural conditioner. Use Total Haircare product twice a week. Application frequency: Use 1-2 times a week. Each course (1 herbal pack and 1 hibiscus gel/powder) gives between 4-6 weeks of usage depending on how much and how often the paste is being used. Treatment duration: On an average most customers use this product for 8-12 weeks depending on how severe the problem is. You could expect to start seeing results in the first 2-3 weeks. 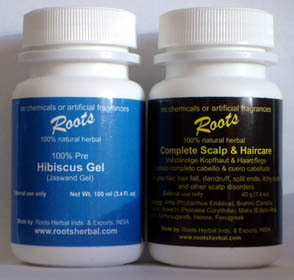 The following cases are an evidence to show how effective our herbal combinations can be in treating almost any hair and scalp disorder.